The definition of the word monster is "an imaginary creature that is typically large, ugly, and frightening", and in this sense monsters do not scare me. When a horror film feels the need to expose some sort of ridiculous looking creature early on, I can't help but feel numb to the entire experience going forward because in my mind I know such things don't truly exist. In order for me to buy in and feel genuine, honest fear, I need to believe the events depicted could actually occur. But what is a monster really? When you see a news report of senseless violent or sexual crimes, you will sometimes hear the person who committed such acts referred to as just that. A monster. Michael Myers isn't merely a monster. For me, he is THE monster. 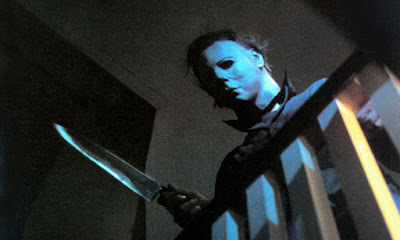 Myers is pure evil personified, and what really makes me afraid of the dark is the fact that while the character depicted is fictional, Michael Myers exists. It may not be a man walking around on a specific holiday with a mask, but the concept of a man whose passion is brutally taking the lives of innocent people is far too real. The opening sequence is bloody brilliant. The camerawork is masterful throughout, as it sweeps through Haddonfield, Illinois with a haunting ease as we often times see the world through the perspective of a madman. As if the pitch perfect direction wasn't enough, John Carpenter also brings us one of the most iconic musical scores not just in the history of horror films, but film in general. Immediately after I finished watching this film, before I began writing this review, I realized I needed to go out real quick and put gas in my car before heading off to work in the morning. As I backed out of the driveway, the darkness seemed a bit darker. The wind seemed a bit windier. On any other night the trees lining my block would have merely been just that, trees, but tonight they felt like hiding places for lurking figures and watchful eyes. My typically perfectly safe neighborhood in Illinois, shortly after the clock had struck midnight and the calendar turned to Halloween, suddenly felt eerie and ominous. Time to go get some sleep I suppose. Better make sure the doors are locked first...just to be safe.